There is a new plant producing digestate at Port Gordon. It is producing a PAS110 product and they are actively offering it to farmers in the area. It is a by-product and this recycling has the potential to improve farm efficiency while producing environmental benefits which should be maximised. There is a lot of interest in the product amongst farmers but they have a lot of questions too. We have also been made aware there have been a number of complaints from the public over the smell. The objective of this meeting is to explain the product and its use to the farmers. We will be highlighting the savings it can make to purchased non-organic fertiliser and how you can make the best use of it while also minimising smell and any diffuse pollution risks. 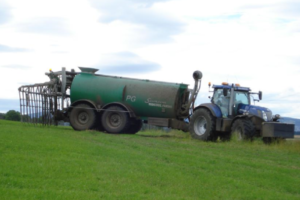 The area around Port Gordon is in the Moray, Aberdeenshire, Banff and Buchan NVZ and we will discuss how digestate it fits into the rules to minimise cross-compliance breaches.